We’re talking basic vision biology science here, and doctor dude not necessarily making all the sense. I don’t even want to post this. 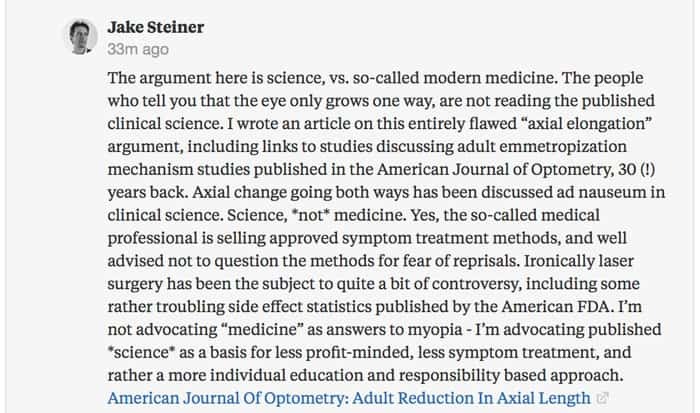 But it’s perhaps worth making the point again, that we’re not always involved in a discussion with science-minded individuals with a lot of knowledge on the past several decades of studies and progressed understanding of myopia. A so-called medical professional is not a scientist. 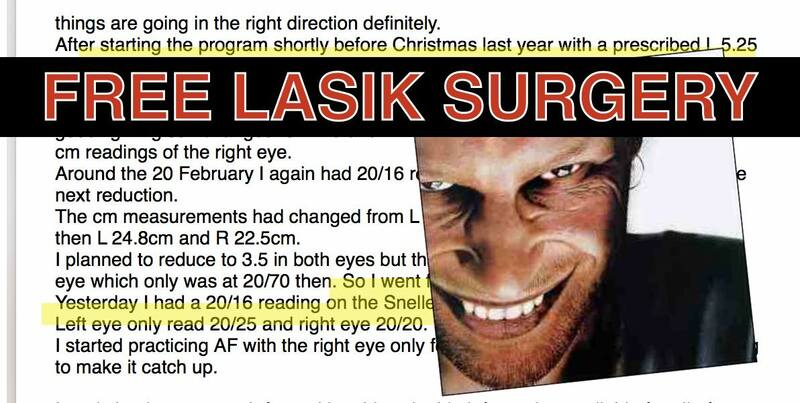 A laser eye surgeon isn’t questioning his own beliefs and ideas, looking to disprove them (as a scientist would). A surgeon has a degree, learned how to conduct a series of procedures, and that’s what he does. 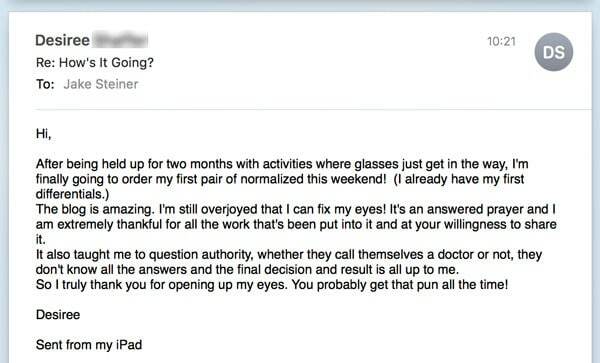 Now this can be a great thing if you have retinal detachment and don’t want to go blind. I’m a huge, huge fan of modern medicine for lots of acute symptom treatments. I don’t like being made to beat up on these guys. I wish they wouldn’t say illogical things, so we wouldn’t have to come out and talk about it. First paragraph, one could almost get on board with that. Maybe without the snarky arrogance. Typical doctor attitudes, a challenge just have a level headed adult discussion. You’re one to talk Jake, you’re thinking. But the real issue with the man’s argument is that there *is* in fact a ton of published, peer reviewed science discussing the very thing he doesn’t understand. No, not Jake’s method. 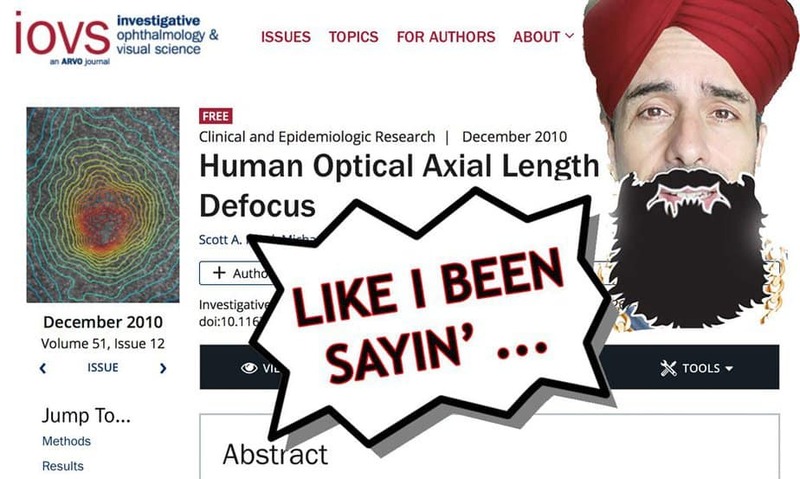 But he doesn’t even seem to realize that there is a huge body of evidence discussing human eye emmetropization as a biological mechanism (your eye changing length actively throughout your lifetime, for best possible eyesight). 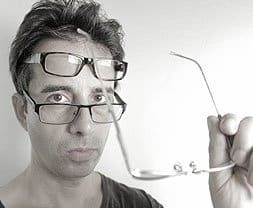 What would be the benefit in me starting arguments with these for-profit, big bucks symptom treatment guys about the validity of endmyopia’s rather specific niche (and free) method, if they don’t even know or read the basic science? Wow, you’re probably be thinking right now. He’s saying the eye stops elongating once we’re adults? The guy must be an idiot. Because really, does any of that even make sense even if you’re not an expert on the human eye? Think about this for a second. If the eye stops elongating “on maturity”, then your myopia would stop increasing, and nobody ever has become more myopic as an adult. That’s right. According to this guy, adult progressive myopia can’t be a thing. 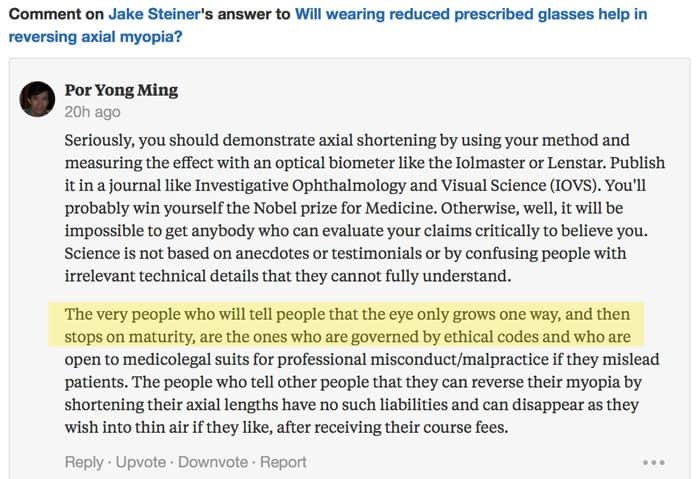 How long and hard could he possibly have thought about this fallacy of the eye growing longer only during childhood, if he’s not even making it as far as the observable, simple conclusion that it’s not possibly a thing? As an eye surgeon he must have seen more than one person with adult progressive myopia. How’s that possible, if the eye stops growing longer after childhood? We do have to give the guy points for being so bold as to say these things in a public forum. A smart man would just shut up, make all the big fat surgery money, and not risk being called out for lacking a clue. Plus snarky arrogance. Takes balls. Here’s the link to the little back-and-forth in case you want to up-vote the slap-down. And there’s this is the article previously posted here on these kinds of arguments (that I mention in the comment). The thing is, I’m always ready to be proven wrong. Show me that we’re not reducing our own myopia. 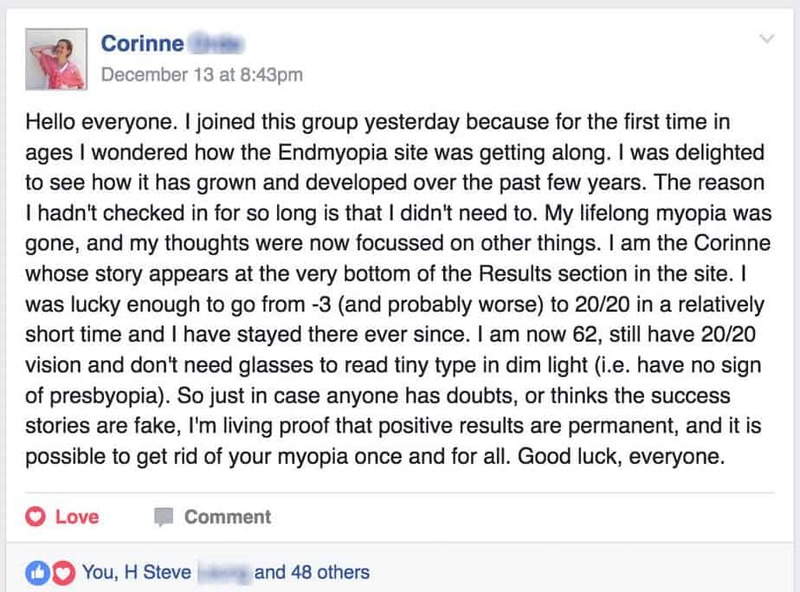 Show me that I didn’t eliminate a full, optometrist recorded five diopters of myopia. Jake, paragliding, kitesurfing, racing high powered bikes without glasses. 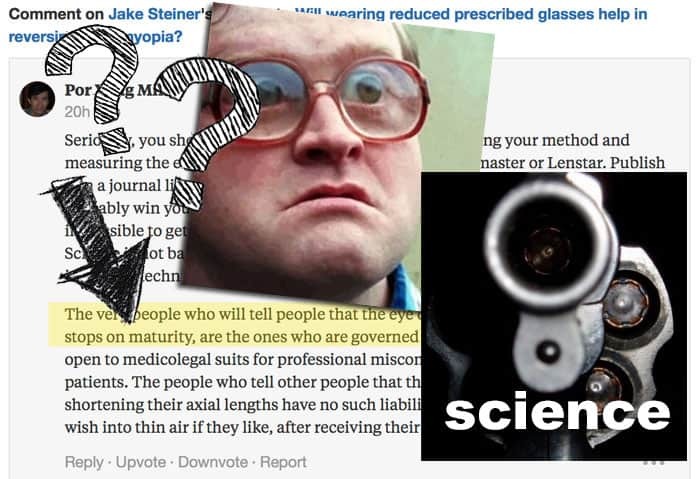 Probably can’t see a thing this Jake with his 5 diopter high myopia. Probably has some kind of batoid radar sense. But really. Have them show any of us how we’re not reducing our myopia. 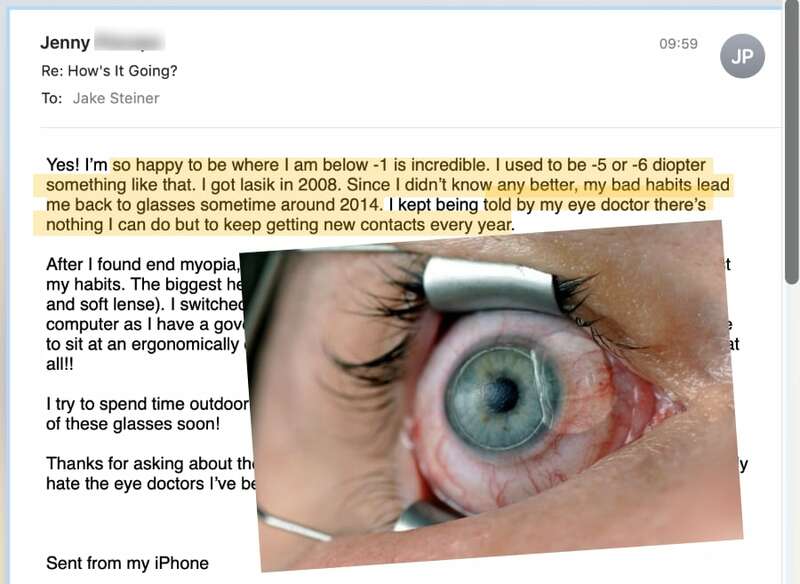 We even have scores of optometrist validated improvement records here. You reading may be nodding your head even now, having made real 20/20 gains. Of course that data is invalid until we publish it. But then we’ll get that Nobel right away because then suddenly they’ll agree that their jobs are irrelevant and their invasive methods are putting your vision health at risk for no good reason. 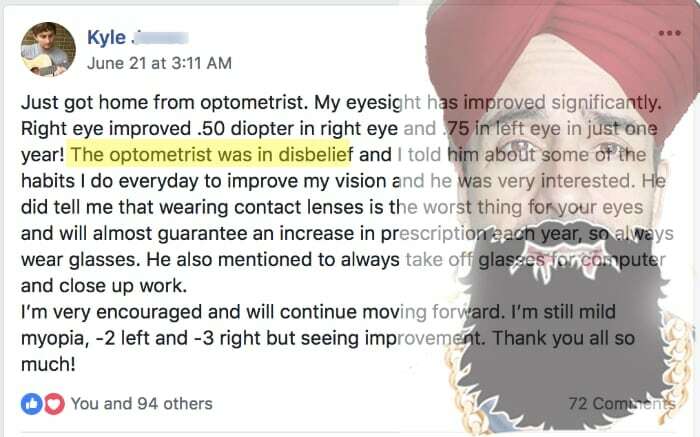 Sure, they’ll get right on that, openly endorsing a competing, free method to reverse your myopia. I really do despise stupid. Meanwhile every time one of these jerkoffs opens their big mouth, the cause-effect of stupid is that Jakey adds an extra hour to the endmyopia allocation. Post a couple of Quora answers, ask you to upvote, write a blog post, maybe even upload a video. That’s a PR nightmare. Every time they go snarky arrogant, we rain down some truth and science on a large and growing audience. Thousands and thousands of us, darling kittehs, supportive of endmyopia. Nodding our heads. Clicking like buttons. Reading. Sharing stories. Discussing. A whole lot of us not-doctor people are a lot less stupid than these arrogant medical types think we are. We realize when things make sense, and despite how dumb they think we are, we do know how to do research and read studies. We learn how to help ourselves. And each other. Unrelated, let’s get a few improvement e-mails out of the way. They’re piling up again. 20% improvement in less than 4 months, pretty good. And his differentials are about to be more than he needs for close-up. Maybe we need to ask him if he’s ok to be part of a peer reviewed study, eh? Nice name. 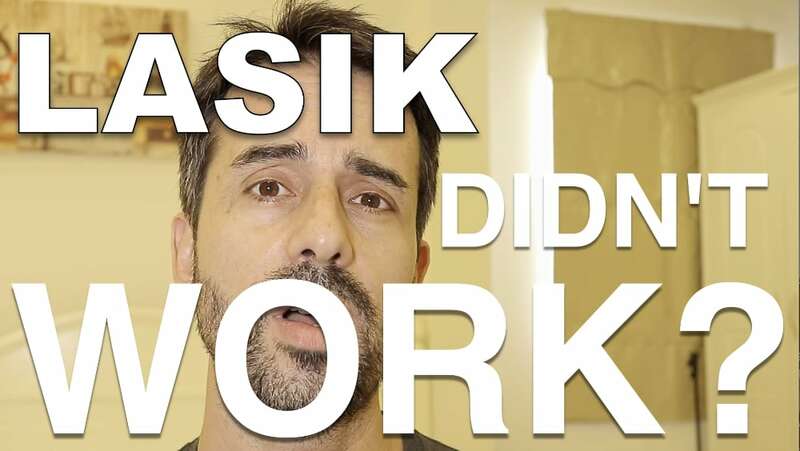 Also probably not going to opt for LAISK surgery. I can see why they’re mad. That’s not going to win us any points with the authority-based degree waving types. Clearly we’re promoting all the wrong attitudes here. That’s it for today. What’s the lesson? The mainstream, selling people elective surgery, making lots of money at it, need to just keep their mouths shut. The less they say, the less people get to figure out what they do and what they know.